The little Kiwi is fast asleep in her burrow. A beam of moonlight shines right down into her burrow. She wakes, and realises it is time. Hurrying out into the night, she wakes each of her friends from their midwinter slumber. 'Kia tere! Hurry!' she urges them. The little Kiwi lead... read full description below. wakes, and realises it is time. Hurrying out into the night, she wakes each of her friends from their midwinter slumber. 'Kia tere! Hurry!' she urges them. The little Kiwi leads her friends through the pingao and onto the beach. It is pre-dawn. They wait, and watch. As the moon slips away behind the hills, the constellation of Matariki rises for the first time, in the northeastern sky." 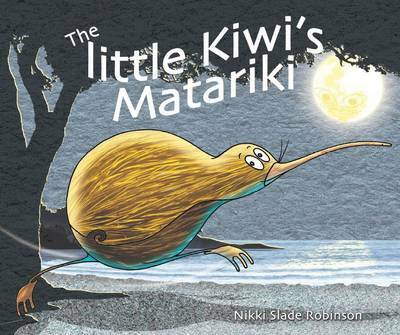 This gentle tale about celebrating Matariki, the Maori New Year, finishes with an explanation of Matariki - it's origins, traditions and how it is celebrated today. The constellation is also shown, with the Maori names for each star. The text contains some simple words in Te Reo Maori alongside the English equivalent. 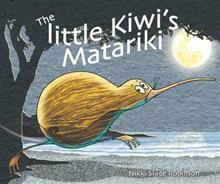 Nikki Slade Robinson has been an illustrator and author for many years and has illustrated over sixty children's books and readers. Nikki's most recent books are Muddle & Mo and The Roadman Boogie.